Who Do You Think is the Hottest Woman In Racing? Racing has always been a male dominated sport. And, even now…how often do we really hear about women in racing? Let’s take a moment to acknowledge some of the hottest women in racing. Who do you think is the hottest? Danica started racing at the early age of 10. She competes in IndyCar and has even made her NASCAR debut. She is also the current face of GoDaddy.com and has graced the pages of FHM and Sport Illustrated. Ashley was the first female to win the NHRA Funny Car. She even won against her own dad, 14-time winner John Force. Her other claims to fame are 2007 NHRA POWERade Drag Racing Series’ Rookie of the Year and 2007 AOL Sports Hottest Athlete. Does she get your vote? Currently racing in the Deutsche Tourenwagen Masters. First woman to test and A1 Grand Prix car in 2005. And, she was the first woman to test a Formula 1 car back in 2002. 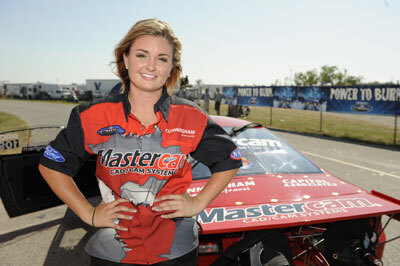 Pursued her passion at the early age of 8and has become the most successful female Pro Stock driver in NHRA history. In only 8 years of competition she has racked up 37 Jr. Dragster wins. Her story was picked up by Disney Channel and turned into the TV movie, Right On Track. Cyndie began her career in racing very early at age 7. From karting she moved on over to cars in 2004 and finsihed sixth her first year in the Formule Renault 2.0 Suisse. A source says Danica Patrick has closed a deal with JR Motorsports to begin racing for NASCAR. Accordingly, Patrick will soon announce a partial Nationwide Series schedule. Concurrently, last week Patrick signed a three-year extension with Andretti Autosport, but her schedule will also allow her to race in NASCAR. And, there is no speculation to how many races Patrick will participate in. It’s official. In 2010, there will be a United States based team competing in Formula 1. Team principals Ken Anderson and Peter Windsor announced that the team’s headquarters will be in North Carolina and will feature engines, chassis and drivers all from America. The Toyota F1 team may follow fellow Japanese car company Honda and drop out of Formula One if their 2009 campaign is unsuccessful. Toyota is the big team with little results and the incoming Toyota president, Akio Toyoda, is expected to cut costs at the company when he takes control. A Formula One team is huge expense for any company. While a successful team reflects positively upon the brand, a poor-performing team is costly and doesn’t provide enough positive exposure to justify the expense. It looks like Toyota will need to win their first race this season to ensure they continue to race in Formula One. There have been a lot of new F1 cars released lately. The style is starting to grow on me. I’ve gone from, “That is ridiculously ugly” to, “That’s not horrible”. Let me know what you think in the comments. Check out the gallery below for the Williams-Toyota FW31. The Toyota Formula 1 team has released their new car for the 2009 season with high expectations. Its called the TF109 and Toyota and its fans are hoping this is the car that will finally bring them a Formula 1 victory. The car looks very similar to Ferrari’s new F1 Car, the F60, which was recently unveiled. The teams are forced to conform to the new regulations mandated by the FIA this year. Many of the new regulations are intended to make passing easier and create a more level playing field for the smaller F1 teams. New regulations also have also been created in order to cut costs in this very expensive sport. Two-time Formula One champion Fernando Alonso was unhurt in a minor plane accident Sunday after his private jet hit a wall at the Malindi Airport in Kenya. No one was hurt in the incident. Alonso was vacationing with his family in Africa. Alonso stayed at the Lion in the Sun hotel, which is owned by Renault team boss, Flavio Briatore.